∙Get them started early by simply wiping their gums daily with a wash cloth or baby toothbrush. 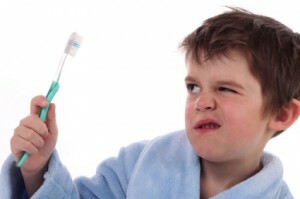 ∙As they get older, involve your child in picking out their toothbrush and fun flavored toothpaste. ∙Make brushing and flossing fun by incorporating games like Simon Says and creating sticker charts to track their accomplishments. ∙Move the brush back and forth gently, careful not to brush too hard. Let your child mimic your good brushing and flossing technique. ∙Remember that sipping on milk and juice causes tooth decay. Limiting these and sugary drinks like soda, and rinsing with water after drinking, will greatly help reduce the risk of dental caries. When the time is right, usually around the age of 3, your child will get to make their first trip to the dentist! We strive to make these visits positive, fun and comfortable. Getting your child excited about their appointment beforehand helps ensure a smooth visit. Dental hygiene is an important part of your child’s good health and good brushing and flossing habits are created early in life. Take the time to make brushing a priority in your house and your children will benefit for the rest of their lives. Together, we can put your child on the road to great dental health.